I’ve noticed a gathering of birds in my garden, lately. Not a menacing gathering, reminiscent of Daphne du Maurier’s ‘The Birds’, but a bright, babbling chorus of goldfinch, chaffinch, blackbird, wagtail and swallow. The swallows haven’t got their full team together yet, but two of our yearly visitors have reclaimed their favourite spot on the telephone wire, where they can chatter and survey the garden to their heart’s content. 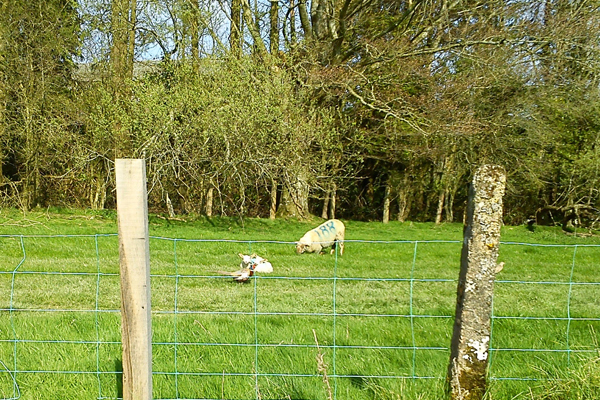 These unsuspecting lambs were photobombed by a cheeky pheasant. Read on to find out more . . . The goldfinches are already seeking pollen, scattering it in golden clouds and perching on our window sill in bold and cheeky fashion. The wagtails, well, you know what wagtails do. They strut, raise and lower their tails as if they are part of an elaborate costume – a fan, perhaps. And as for the chaffinch, (singular, as I’ve only seen one), I wasn’t sure what kind of bird he was at first. Luckily, Google came to my rescue, confirming that the pretty contrast of blush and blue did indeed belong to a chaffinch. He’s a bit like a spring-time version of the robin. While I’m going bird-crazy, let me also mention lambs, (seen at the top of the page and photobombed by a determined pheasant). These lambs made my day when I spotted them at the side of the road. They looked so relaxed in each other’s company and seemed to symbolise the hope and expectation that Easter brings. Of course, it also brings chocolate, family, traditions and a long weekend. One of my Easter highlights was a walk at Kilmurran Cove, sliding down the stones to firm sand, rock pools and a lapping tide. We saw what we thought were two seal heads, bobbing up and down in the water. On further inspection, they turned out to be rocks! 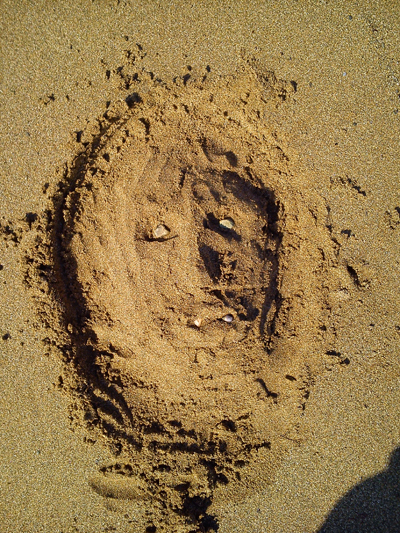 To make up for the disappointment, Hubs set to work, sculpting a face out of the sand, using stones to bring out his eyes. We had left our mark. Sandman with a twist . . . Hubs added in some fangs to give his creation a menacing edge! Photo: K. S. Moore. Since then, I’ve been trying to make some marks on the page . . . I’ve entered a poem for a competition and I’m putting the finishing touches to a submission. I only just noticed that the National Flash Fiction Day anthology is now open for entries, so I might give that a try too. I’m fully immersed in my novel again, having negotiated my way out of a sticky patch. So you could say that me and my pen are back in the game, ready to create something new and wonderful. If only we can find the right words.